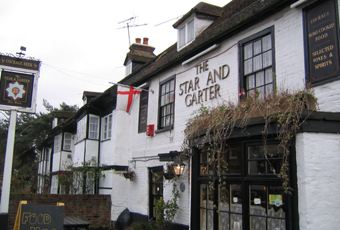 As promised, I went to the Star & Garter Beer fest last weekend. I was not disappointed. 15 Ales;- milds, stouts, porters, golds, bitters, the lot. All from local breweries with the exception of two beers from Manchester. (It transpires the manager is from that place) Plus 5 ciders. The festival was held in an outside shed which has been named Festival Hall for the occasion. A tasty BBQ and great music. I went on the sunday so missed the Papa George band on Saturday, but enjoyed the Uk Ukes on the sunday. a very good band, great ale, good food and fortunately good weather. and all round great day. As tmitch says rather understatingly, this is a great pub with a great selection of Ales. Unfortunatly I missed the Beer festival back in May, but there is to be another one over the second weekend in August, and a Cider Festival in September. I will be attending both of them. There are also some great musicians who play at the pub, how the manager gets them into the place and still have room for customers is anyones guess, but though its a small place it wont take many to get packed. Definately worth visiting frequently. 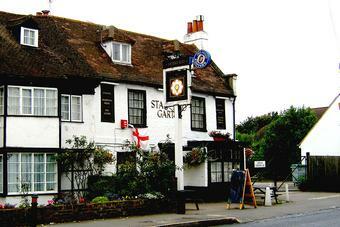 I've now visited the Star and Garter and found the drink and atmosphere ok. Another pub I will visit again. Too soon to post a full review but the Courage Best was served perfectly. At �2.95 a pint the price was great too.